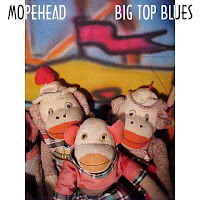 After I moved to Oakland (and Jay to New York) I began recording and compiling quite a few mopehead songs. Some of the tracks I recorded with Brian Peet, but most of them I recorded on my own. I'm not sure why some of the tracks made it onto mopehead discs while others made it onto Rain Station discs. Both "Big Top Blues" and "It's Always Good" were put together after the songs were recorded. Jay provided the cover art for "Big Top Blues". He also helped me decide which tracks should be put on which disc. The tracks on "Big Top Blues" are all pretty strange - in a sort of novelty vibe sort of way. Most of them were written to give me some weirdness to send East to Jay. Some of these tracks were recorded on the digital 8 while others were on my old 4-track. "Pimp Rock Superstar" features vocals by Brian Peet and my ex. Bubo (the "person" referenced in the track) is a statue of an African drummer that we found in the Rain Station in SF. I've had him ever since. "Mr. Moores In New York" is obviously about Jay in his NY habitat. The "chickie count count" backing vocal is My Monkey. "Monkey Times" yet another song about My Monkey. More "chickie count count" goin' on. "International Monkey" is yet another song about, what else, My Monkey - and more "chickie chickie count". Brian Peet sings backing vocals on this one as well. OK, I think it is time to talk about My Monkey (and I do sing about it in my song called, "My Monkey" on SS-MOPEHEAD...another disc I'll try and get up onto Bandcamp). My Grandma made me a sock monkey and from I recall she gave it to me when I was around five. I really loved that monkey and named him "Funky Monkey". Well, my Mom didn't like that name since it sounded too much like the "F" word, so she forbade me from calling him that. I didn't understand (and at five who could blame me). So I called him my monkey, but I knew his name was "Funky Monkey". Anyhow, I've kept that sock monkey and still have him today. A few years after I got him I also got a Snoopy stuffed animal (the ones that you can buy clothes for). I got disco clothes for Snoopy and decided to put the pants on My Monkey (and he's still wearing those pants today). Anyhow, that's a little monkey history lesson for you. "Every Day, Every Year" is a Halloween tune pure and simple. I have quite a few Halloween tracks that have never been released. I supposed I should some day unleash them onto the public. "Funky Monkey" is a lo-fi tune about, what else, My Monkey. "Feelin' Sci-Fi" is another "Halloweenie" track. It sort of reminds me of the music I listened to when I was a kid - Steve Miller Band, Steely Dan, Wings and 70s/80s funk (I could go on and on since I am a music fiend and listened to nearly everything growing up). "Chompo The Clown" is yet another Halloween track with the added bonus of the "chickie count count" going on. "I Like The Breeze" finishes up the CD - a bit of a love song - another song about boats. So what's with the boats, Mark. Well, I can try and explain it two ways. My father was in the Navy - he loved boats. I can remember spending time with him on all sorts of boats - from yachts to row boats to steam boats to destroyers. His naval years made a huge impact on him and he made a huge impact on me. It could also be due to my near drowning as a kid (I think I've nearly drown a few times). I've always had an iffinity to water, oceans, lakes and rivers.